Towards the end of the life of the old Laguna Honda, Dr. Sweet began looking around for ways she could pass its lessons along. One way was by writing a book that let others experience what she’d experienced—this is God’s Hotel. A second way was to take its lessons—about the importance of the personal in medicine, of tincture of time, of the little daily things, and of the efficiency of inefficiency—and try them out. The project would compare the efficiency of the new Modern Healthcare with its electronic health records, its deskilling, its formulas, directives, regulations, and micromanaging, to the Way of God’s Hotel. This is the Ecomedicine Project. The idea would be to demonstrate that a new approach to the long-term care patient—an ecomedical approach—is cost-effective. 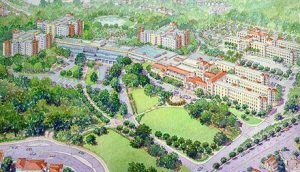 Before the move to the new Laguna Honda, Dr. Sweet imagined putting an Ecomedicine Unit (the ECU) in the former hospice unit, with its already established gardens and homey living spaces. The ECU would be a twenty-four bed minihospital, and Slow Medicine would be its medical approach. What would make the ECU “ecomedical” would be that natural medicaments would be preferred to synthetic ones, and organic food, fresh air, sunlight privileged over prepared food, artificial light, and air conditioning. At the end of a two-year pilot project, data would be analyzed as to the ECU’s medical outcomes, cost, staff health and morale and patient and family satisfaction. Dr. Sweet was pretty sure, given her experience at the old hospital, what those outcomes would be. Unfortunately, the plan for the old hospital is to replace most of it with a parking structure. And, while the new facility is beautiful and quiet, it lacks that sense of community, that village sense, that the old hospital had in too much abundance for the Department of Justice, but which was, in itself, healing. Perhaps it will come, with time. 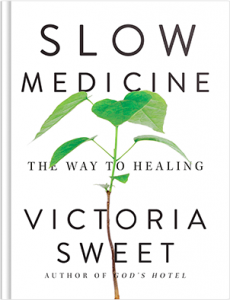 Meanwhile, the Ecomedicine Project awaits some new old place in which to experiment with Slow Medicine.